How to Build a Business That Lasts a Hundred Years? Indeed, why should one even think of building a business that survives for a hundred years? Look at the Exhibit below. Whereas human lifespans have increased over the last 50 years and today the average longevity in the developed world is close to 80 years, corporate longevity has been shrinking steadily. 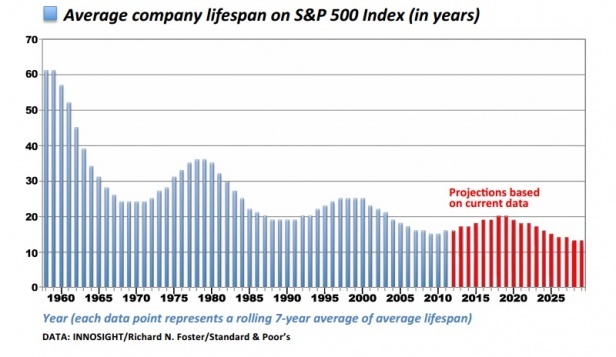 Over the same period, corporate lifespans have shrunk from over 60 years to less than 20 years, and are projected to shrink further in the next decade. Another key marker to look at is the five-year mortality risk for corporations. From less than 10% fifty years back, today the five-year mortality risk is 33% in many sectors. Therefore, we can no longer cast aside the need to look at building blocks for corporations that will outlive the founders and be a legacy for future generations. Of course, management gurus and thinkers have provided us with many frameworks, business models, and templates for sustainability. Martin Reeves of the Boston Consulting Group has an interesting model that is as refreshing as it is counter-intuitive. The model is the human immune system. The immune system that has evolved over anthropological time periods has some distinct characteristics. Redundancy – the human system has multiple redundancies. If one layer fails, there is another to take over. As a simple example, nature has provided us with two lungs and two kidneys. From a clinical perspective, one each would be just fine. When you look at a highly complex system like the brain, you will find that an average person utilizes only a fraction of the cognitive capacity. Most of you would have traveled in a Boeing 747 or an Airbus 340 – two aircraft having an impeccable safety record. Both have four engines. Technically, both can fly with two engines. Pilots undergoing training in a simulator are trained to fly the plane on one engine under certain conditions. The apparent redundancy reduces the probability of total failure to a very small figure. In contrast, the Dreamliner or the 787 which has larger windows, two engines, and a lot less redundancy to enhance efficiency, has had to face numerous problems and to date has not been able to address them fully. In 2016, the Federal Aviation Administration ordered fixes on General Electric engines used on some Boeing 787 Dreamliners calling the measure “an urgent safety issue.” Yes, the plane can fly on one engine. The fact remains that the 787 is yet to find a place among the safest planes to fly. Modularity – conventional wisdom treats the human body as a closed system. However, breakthroughs in stem cells and genetic engineering are bringing us ever closer to treat the human body as a modular system. Cornelis Vlasman and his team have shown through their prototype OSCAR that living organisms can be “built.” OSCAR is the size of a human hand and consists of clickable modules grown from human cells. A modular approach in stem-cell technology could see breakthroughs in the treatment of dementia and Alzheimer’s in the next few years. Cells taken from a living brain can be “grown” in a lab and re-planted to take on the role previously played by diseased cells. Modularity in economic and organizational design ensures adaptability and evolution to meet changing demands. A modular architecture specifies the interfaces between functions or processes or components or even industry structures either as strategic intent or as an emergent outcome so that one can build a large range of component variations into the system without having to make changes in the functions or processes and without having to change the interfaces. We can see modularity all around us – from computer components to automobile subsystems to the units that make up a modern kitchen. We insulate organizational process in a way that autonomously creates inter-dependencies. We create functional silos that inevitably lead to personal fiefdoms. Organizations with modularity are increasingly abandoning hierarchies for “roles” and interchangeable functions. In fact, the rapid rise of Japan as an economic superpower had much do with the concept of job rotation. Even today, Japanese corporations exhibit modular characteristics more than their counterparts in the OECD countries. Diversity – 98% of our DNA structures are the same. With the 2% that are different, each of the seven billion people on this planet is unique. As complex as the universe is, we have within each of us an equally diverse and complex set of subsystems. If we want to look for diversity in all its myriad forms, we need to look no further than the human system. Thomson Reuters reported in September 2016 that based on an analysis of the practices of over 5,000 companies worldwide, diverse companies (not necessarily diversified companies) create more innovative products, happier customers, and better financial returns. The study found companies that consciously embraced the concept of a diverse workforce consistently outperforming their peers. The company is reinventing itself in correcting this shortcoming. Proctor & Gamble, Cisco, Microsoft, and Johnson & Johnson all make it to the top 25. Time will tell whether Google and Alphabet can catch up. Many are skeptical because the initiative to improve diversity has not come from the leadership. Prudence – the human system clearly outperforms any other system when it comes to resource optimization. The speed with which the central nervous system rushes impulses, messages, and resources (oxygen, blood, antibodies) to a part where they are needed the most is beyond imagination. Organizations that consistently beat the odds show the same level of prudence. How has Southwest been able to ride the severe storms that have driven many large players out of business? You will see the single-minded pursuit of prudence (cost leadership), modularity (having only one type of aircraft), and embeddedness (service is deep rooted in the organization’s culture). There you are. If you wish your organization to be around for a hundred years or more, just think of the human system. Implement the principles of redundancy, diversity, modularity, adaptation, prudence, and embeddedness.